City Hall as seen from the courthouse steps. Don’t look for a local gas tax proposal any time soon. A local gas tax for Albany? You won’t have to worry about this for a while. The city council is making no move to put it on the ballot in the Nov. 8 general election. And whether it will try in 2017 is anybody’s guess. 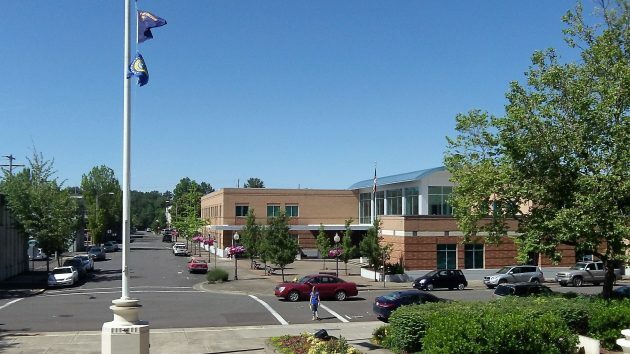 Mayor Sharon Konopa had hoped that Albany and Corvallis could both vote on a local gas tax this November. But she told the council Wednesday that Corvallis was not ready. And without Corvallis going along she’s not pressing the Albany council to move on its own. There was vague talk about checking on the next possible election date. But for a major issue like this, you’d think the council would want to stick with a primary or general election. So that means 2018. In the meantime, the 2017 legislature is likely to come up with a “transportation package” that includes a jump in the state fuel tax, now 30 cents a gallon. That presumably would make voters even less inclined than normal to approve a local tax on top of the state and federal ones, which now total about 48 cents a gallon. The mayor’s idea is to link a local gas tax to specific street repairs. The city staff says they could come up with a list projecting street repairs over five years. Whether that would help pass the tax is unknown. Voters whose streets are not listed would have no greater incentive to support the tax than without such a list. Albany resident Ray Hilt had asked the council to support a gas tax to start repairing streets, and he did so again Wednesday, suggesting 5 cents a gallon. But he was alone in advocating action now. The current tax structure is sufficient to handle our needs. These “end runs” that promote special desires are just distractions from the prevailing system to give those special needs special advantage. I think 48 cents per gallon is quite enough, thank you very much. Observations comparing gas prices of the Salem and Albany areas suggest prevailing prices are lower in Salem already. Adding a nickel or dime to the gas prices in Albany will widen the price gap even further. Using “Gas Buddy” app does show 2 (only) stations in Salem cheaper – by 3 cents. All others same… Of course that pricing changes – sometimes daily, as folks report new pricing[s].